If imitation is the sincerest form of flattery, I should probably be feeling very proud of myself at the moment. You remember how a couple of months back I strained my eyes to exhaustion by counting the marchers at the ‘March For Choice’, reaching a total of 850 or so marchers, which tied in pretty neatly with my initial estimate, a second estimate based on how much space Roman armies used to take up – because, after all, counting crowds is part of my training – and what people on the march had said about how much space the march took up, and the figures first reported by the Guards and the Irish Times, before they were pressurised into changing their numbers? Well, somebody’s tried a similar kind of thing with Tuesday’s ‘Vigil for Life’, one Andrew Flood, writing on the Workers Solidarity Movement website, having valiantly taken up the gauntlet to count Tuesday's numbers, and, after dotting away on a 19-second video, having counted 1029 people at the vigil. Andrew says he’s using the same method as me, but he’s not, and that should be obvious; I used three methods, none of which was without problems but all of which gave results in the same range, and for one of them I relied on information given by pro-choice friends who were on the march. There is a superficial similarity between Andrew’s method and one of mine, as both of us took screenshots from a video and dotted heads as we counted them, but they’re substantively different. It’s ludicrous for him – or anyone else – to say we used the same system. I counted based on video footage taken close up in daylight from a single inspection point near the end of the march, this being pretty close to best practice when counting moving crowds, whereas Andrew counted based on low-resolution video footage taken from a distance, at night, with such foreshortening that the rear two thirds of the vigil are basically indistinguishable. This, you can be sure, is generally not how stationary crowds are counted. Still, I think Andrew deserves some credit for trying. It’s tedious work, and isn’t easy on the auld eyes. On first reading this I was quite impressed. After knackering myself counting a crowd close-up in daylight, there was no way I’d have tried to do the same thing with a swooping long-range camera in the dark. Indeed, I’d looked at that same 19-second video before Andrew had done so, and assumed it wouldn’t be possible to count that crowd. It wouldn’t, I thought, even have been possible to estimate. I’d seen somebody claiming there were only 300 there; I’d also heard that Youth Defence were claiming 10,000, which struck me as daft. 2,000 sounded quite plausible the way these things go. And, in truth, that’d not be a bad number, for the afternoon of a cold weekday, and everyone still at work. Still, I thought, I really wish people wouldn’t bump up their own numbers. 10,000 seemed almost as absurd as Ivana Bacik’s fantasy 5,000 at her March for Choice. Should’t we at least try to be honest? And then, after a few moments, I watched the 19-second video again, with the screen enlarged, freeze-framing as I went. I didn’t keep the stills, as with the one I’d worked from at the start of October. I just paused, and looked, and showed them to a (bored) friend, and very quickly concluded that this couldn’t be done. Yes, I could see Andrew has taken four screenshots – as compared to the twenty I used for the ‘March for Choice’ – and dotted away, and done so ingeniously, applying red dots to people holding candles and green ones to people without them, but looking at this critically, I just didn’t think this was possible. It was dark. The camera moves. It’s shot from a distance. There’s serious foreshortening with the crowd. The video’s low resolution. Still, it seemed an honest attempt at this, and I thought credit was due to him for trying. I only started to get uneasy when I heard somebody saying that about 2,000 people had come up to the vigil from around the country on buses they’d hired. Was that credible? Well, a friend said that Youth Defence and the Pro Life Campaign people had told him that their local chapters had organised buses for 1,400 and 1,200 people respectively. That’d give 2,600 who’d come up in buses from the country, leaving aside people who’d made their own way there and those from Dublin and roundabout. Allowing for some double-counting, 2,000 sounded plausible. What’s more, other data seemed to support this, as I heard of one person having personally arranged four buses from Galway, and of two buses having come from Monaghan, which has a lower population than all bar four Irish counties. More populous counties, you might think, would send more. Still, modern coaches take 55 people, while minibuses take 15-20, so even if we low-balled our figures, and assumed a coach and a small minibus from each county outside Dublin, that’d give us 2,170 people. 2,170 people excluding those who’d come under their own steam, and people from Dublin itself. Is a figure lower than 3,000 even remotely credible? Common sense seemed to give serious grounds for doubting Andrew’s numbers anyway, so I decided to think about these figures again. The basic rule for crowd estimation is a straightforward equation based on space and density; it gets more complicated with moving crowds like ‘March for Choice’, but when a crowd’s standing still, as at a peaceful vigil, it’s pretty simple. To work this out you need precise maps with street measurements, multiplying width by length to get the area, which you’ll remember from school. Then you apply a rule of thumb that three people per square metre is comfortable and four is like a rock concert – the rule can vary between cultures, because Americans, for instance, tend to need lots of personal space, but this works well for British and Irish people. It’s important to keep in mind that density tends not to be uniform, and that crowds tend to be more compressed in some places, less compressed in others. When dealing with marches you have to get stuck in and actually count samples and work out how long it takes people to pass certain inspection points – two or more for preference, but you do what you have to – but with a stationary crowd you can and generally should just work with area and density. So the professional crowd counters say, anyway, and a variant of that is my normal practice when dealing with battle accounts; it’s hard to read a field unless you’ve a good idea how many men fit on it. So, how much space did the Vigil for Life take up? Well, if you’d selectively read the Twitter feed at the time, you could be forgiven for thinking there was hardly anybody there at all. “Tiny numbers at #vigil4life somewhat magnified by photos not revealing entire centre street is speakers platform,” it continued, proclaiming, “Pictures from scene suggest #vigil4life in hundreds @drivetimerte claims of 1000’s nuts,” and retweeting “They’re pipping cheers through speakers!! I'm at #vigil4life this is nuts. About 4-500 tops”. Workers Solidarity Movement, then, seemed pretty sure at the time that there were only a few hundred there. Perhaps as few as 300. Certainly not the 1029 Andrew himself would subsequently count, let alone the 2,000 he was eventually to hazard, or the 5,000 Nell McCafferty – no pro-lifer she! – estimated on Facebook after having a gander on the spot. @WSMIreland posted a few interesting pictures along the way. This one, taken from the Stephen’s Green end of Kildare Street is particularly good, as it shows the front end of the vigil, spilling forward from Molesworth Street across Kildare Street to the front gates of Leinster House. Well, it would show that if the Vigil had been along Kildare Street, but it wasn’t: it faced the Oireachtas buildings, rather than, say, the National Library and the National Museum, though it seems to have rather sprawled a bit on Kildare Street, if this rather colourful image is accurate. It’s almost as though WSM Ireland wanted to mislead people. Or just didn’t have a handle on what was going on. What’s your money on? Spectacular incompetence or egregious dishonesty? Either way, it doesn’t do a lot for their credibility on this issue. I like this one too, which shows that the crowd stretched back to the junction of Molesworth Street and South Frederick Street. That’s useful. 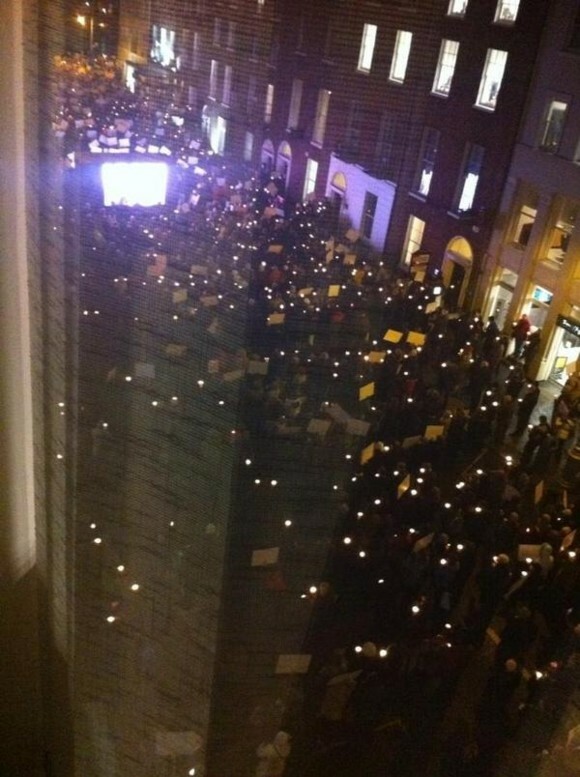 A shame about the tweet linking to it saying “Picture showing spread out #vigil4life rally not even half filling Molesworth St. despite massive spending by bigots,” but there you have it. I’m not quite sure why a determination to protect human life, and an unwillingness to have done unto other human beings what we would not like to have been done unto us – basic Golden Rule stuff, when you get down to it – constitutes bigotry, but let’s leave that for now. Well, now we have our crowd dimensions, if it not its density. The crowd on Molesworth Street stretched from wall to wall, taking up the footpaths rather than just the road, and as I’ve said, it went from the junction of South Frederick Street to the gates of Leinster House. Let’s pull it up on Google Maps, shall we? I’m going to disregard the overspill sections on Kildare Street, because I have little idea how far the crowd spilled to left and right, and less idea how dense the crowd would have been where it wasn’t penned in my the edges of Molesworth Street. It’s best, I think, to treat it as a straightforward oblong. Well, looking at the scale, and measuring it out like we used to do in geography class, it seems that the vigil must have taken up a space about 20 metres wide and 130 metres long, which – leaving aside the odd obstacle such as vans and screens – gives us 2,600 square metres. 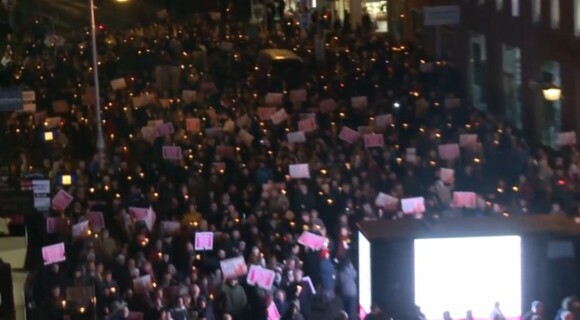 Now, according to the standard rule of thumb which sees three people comfortably together per square metre, this would give us 7,800 people at the vigil, or it would do if there were no obstacles. If everybody was jammed together like at a gig, well, then we’d get 10,400, which supports Youth Defence’s claims, but I think we all know it wasn’t that crowded, so let’s stay with 7,800 tops, assuming a consistently comfortable crowd density. But obviously we need to lower that because the area wasn’t entirely occupied by the crowd; looking at the aforementioned 19-second video, and a rather longer one made by Youth Defence, it looks as though they shared that 130 x 20 metre zone with a big screen, a speaking platform, and two or three vans. None of these obstacles was all that big: if you look five seconds into the 19-second video, you’ll see that the platform can’t have been much more than 6 metres on any side, despite @WSMIreland’s claim that it took up the “entire centre street”. To be honest, looking at it in the Youth Defence video, I doubt any of its sides were more than 4 metres along, but let’s go mad and say that was 6 metres on each side, and go with, I dunno, 6 metres by four metres for the screen thing towards the back, and 5 metres by 2 metres for each of three vans. All told, that means 80 square metres need to be knocked off our total. 2,520 square metres with three people per square metre at a consistently comfortable density, gives us 7,560. If the crowd had been packed like in a concert, that rises to 10,080 people, which ties in with Youth Defence’s claims, but judging by all the photos I’ve seen, and video footage too, I’m no more convinced by that now than I was on Tuesday; 10,000 has nice rhetorical value, but I think that figure’s wishful thinking more than anything. 7,560 sounds a lot more plausible to me, though it assumes an evenly packed crowd. Generally you should allow a 20pc margin of error on these things, according to the aforementioned Nigel Stanley, which suggests that there could have been anywhere between 6,000 and 9,000 people at the vigil. Watson and Yip, however, reckon that if you’re confident on crowd density and area, you can apply a 10pc margin of error, which means somewhere between 6,804 and 8,316. RTE’s eventual “several thousand” starts to sound reasonable when put that way, and the figure of 8,000, claimed by the Pro Life Campaign since Tuesday is certainly very possible. It’s not far off the mark, at any rate, and may in fact have been a conservative estimate. 6,000 sounds like a plausible minimum figure, then, but on balance, I’d go with 7,000, allowing that it might well have been rather more than that. So how on earth can Andrew have gone so wrong, assuming he did so, which even the bus figures suggest he must have done? An obvious starting point is that Andrew expected the numbers there to be low to begin with, as can be seen at how at 16:48 and 17:00 he’d retweeted the WSMIreland saying “Looks like crowd at #vigil4life tiny fraction of crowd at any of the #savita protests despite national well funded mobilisation by bigots” and “tricky to estimated size of #vigil4life as view obscured by expensive giant video screen & fancy PA but maybe a little over 300 #savita”, before opining that the vigil’s organisers would have got a better turnout if they’d paid random people €50 each to attend. Less than an hour or so later, in a thread which began with somebody else claiming that only about 300 were there, he said that pictures clearly showed that the crowd didn’t go halfway down Molesworth Street and were very spread out, with there being hundreds there, not thousands. 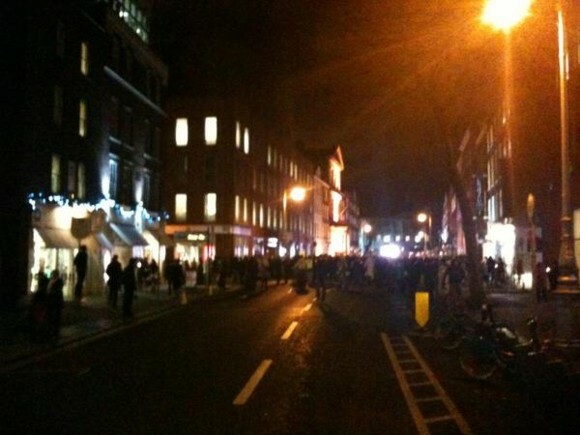 At 19:33 he repeated the claim that Molesworth Street had been less than half full. Of course, even leaving aside the issue of density, it’s irrefutable that the crowd went as far as South Frederick Street, which is more than halfway down Molesworth Street. Still, regardless of Andrew’s predisposition to number the vigil crowd in the hundreds, the video he worked from is of very poor quality, as I’ve said. It’s really hard to count from that, and when you contrast the video with the Google overhead shot, you start to see a massive problem. Look at the van which is on the border of his third and fourth panel. That van, which is three quarters of the way back in Andrew’s montage, was only a third of the way down the crowd-occupied portion of the street. I’ve marked its location on the overhead shot, locating its position with reference to buildings identifiable beside it. Tucked away? 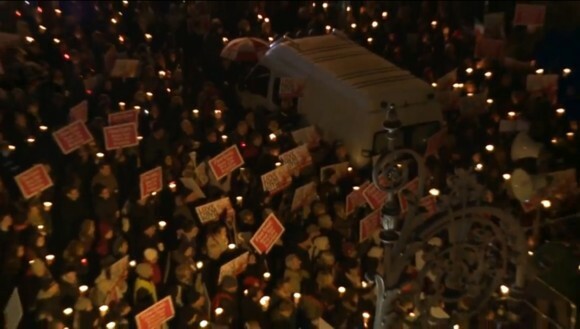 Two thirds of the vigil’s length was behind that van! 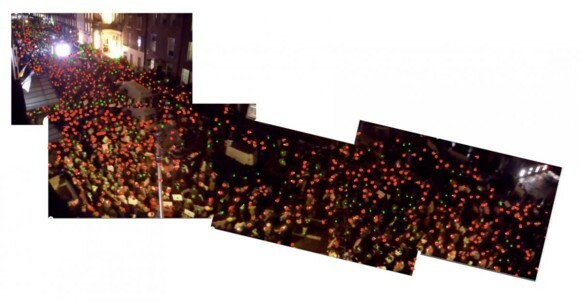 But then, Andrew doesn’t seem to have had any concept of that, claiming as he had done twice that evening that the vigil took up less than half of Molesworth Street, rather than about 60pc of it as well as a sizeable area on Kildare Street. Andrew’s count has 558 people in the three frames ahead of the van, and 471 in the frame behind it. Or, putting it another way, he has 558 people in the front third of the vigil, and 471 in the central and rear two thirds combined. Now that doesn’t sound very likely, does it? Of course, it is just about conceivable that this could have happened, and if you work from a single source, as Andrew appears to have done, it can happen that you can get desperately misled into believing such highly improbable things. Single-source journalism, as the Irish Times seem to be discovering nowadays, is a mug’s game. The thing is, though, we don’t need to work from a single source. Here, for instance, is a still showing the back of the crowd, taken from that slightly longer Youth Defence video I mentioned earlier. It’s a far better resolution than the video Andrew used, and gets in a lot closer, and shows us that the crowd was pretty dense at the back where Molesworth Street reaches South Frederick Street. Not crushed together like at the front rows at Slane, mind, but tightly packed for all that. Not surprising, really, given how cold it must have been. Ah, but was it all like that? Perhaps it was dense at the very back, and maybe at the front, but nowhere else? Well, you know that van that Andrew used as a marker, the one that’s a third of the way back? Well, here’s a shot of the area around that. We’re dealing with a pretty tight crowd, all told, pushed up right to the sides of the van. In fact, there seem to be about thirty people next to the van occupying as much space as the van. Again, it’s hard to count, given the darkness, but if we enlarge and squint and drop van-sized counting frames into position, it seems to back up the overall impression that this crowd is pretty compact, with roughly three people to every square metre. So far I’m not seeing anything to suggest that this was a sparse crowd. It has to be said that Andrew, in his count, shows a screenshot where there’s what looks like a patch of spare ground. He presents this as evidence that the crowd was scattered. You can see it, about five seconds in. Watch the video. I could be very wrong, but I’m pretty sure this is the enormous “speakers’ platform” we keep hearing so much about. Yes, I know, not that enormous then; indeed, if you look at it on Andrew’s stitched together four-frame shot, you’ll see that it’s not that much wider than the speaker on it is tall! In any case, it seems to be the only decent-sized gap in the crowd, and certainly shouldn’t be misrepresented as evidence that people at the vigil were standing metres apart. Anyway, these last couple of screenshots from the video with higher resolution don’t merely give us an indication that the crowd density was high throughout. 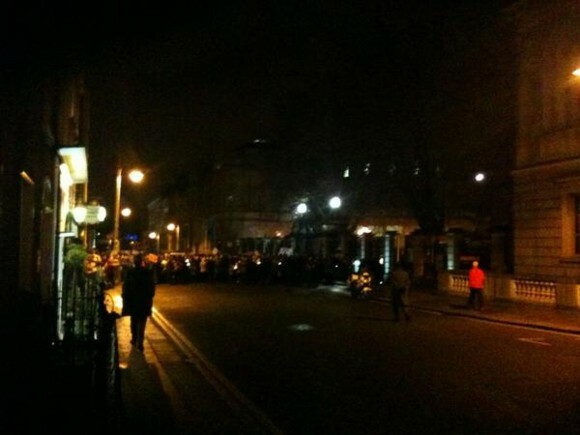 They also reveal that there were far more people at the vigil without candles than there were with candles. Seriously, try counting them. Take other screenshots from the Youth Defence video if you like, and if you can find good enough shots. You’ll find the same pattern across the vigil. This is especially interesting, because Andrew’s count suggests that there were slightly more than twice as many people with candles as without. His figures give us 323 people without candles, as opposed to 706 with them. But it’s very clear from the better quality video footage that this ratio could hardly be more wrong. Indeed, on the evening of the vigil, it seemed that @WSMIreland really didn’t grasp just how many people lacked candles, as can be seen in the caption to this picture saying “pic showing how #vigil4life organises have spread out crowd to make numbers appear greater at ground level”. Leaving aside how poor quality this shot is, those dark patches clearly aren’t empty spaces. They’re people without candles, or people whose candles are blocked from the camera by their bodies. That Andrew’s figures are hopelessly wrong can be seen by looking at that shot of the very end of the vigil. Andrew says he counted 167 people behind the screen, though having enlarged his pictures I can’t even see half that many dots. Do you reckon you can do better? On the clearer picture, I mean, not in Andrew’s foreshortened thing. Me, I gave up after 300, thinking that life is too short for this sort of thing. That said, given that life is too short anyway, I’m glad more than 6,000 people took to Dublin’s dark streets on a cold weekday evening to say that we shouldn’t be cutting it short for others. I half-agree with him. I don’t agree with his conclusions, or with his belief that only 15pc of the population are opposed to abortion, but I do agree with this: this isn’t a matter of numbers. Either we believe human life matters, and that without a right to life we can’t have any other rights, and that we shouldn’t deny others the opportunities we’ve had ourselves, or we don’t. Ultimately it comes down to that. As someone who was actually there, and decided out of curiosity to stroll down to the end of the street and back, your count is borne out by the experience on the ground: fairly tightly packed crowd, some with candles, most without (too hard to hold banner and candle at same time plus it was fairly cold so lots of hands in pockets! Because of light from screen, I couldn't see past it from the top, so was pleasantly surprised to see the thousands behind it when I went down there. Couldn't understand why the camera pan looked more sparse - til I realised that most people who didn't have candles were almost invisible in that shot, and crowd past the screen is almost impossible to make out in that footage. But most of all, I think your conclusion is just spot on. Even if only 10 people had turned up "either we believe human life matters, and that without a right to life we can't have any other rights...or we don't." Great work! Reminds me why I never had the patience and sheer bloody mindedness to become an historian!! Andrew, it's only fair to point out, has taken issue with the above calculations, and has raised concerns here. The former method works perfectly well for counting stationary crowds. If a crowd is on the move, however, then you need to work out how long it takes crowds to pass points. head and a ragged, spread-out tail, and then gather more compactly at the destination to hear the speeches. The crowd estimates are considerably more uncertain for a mobile crowd than for a static one." The solution, generally, if to use inspection points and count the people passing them, with Watson and Yip saying "The method is to choose an inspection point P, generally near to the focus, and to 'count' the number of participants passing this point." This method's not ideal, of course, as people can have left the march by that point, though if it's a relatively short march to a focal point where there'll be speeches, the likelihood is that inspection points will give a pretty accurate result. Ideally you'd have more than one inspection point, but you do what you can. Now, Andrew says that his method used to calculate the numbers used at the Vigil for Life was the same used by me for the March for Choice. This is untrue. It bears similarities to the third method I used when calculating numbers at the March for Choice. It is, however, not the same as it -- my March for Choice counting was based on counting from a largely stationary camera and close range in daylight, rather than a swooping camera doing an overview from a distance at night -- and is notably for being a single method, rather than the third of three. Ignoring the fact that I used three methods for estimating crowd size, Andrew says that "Thirsty Gargoyle wasn't at the March for Choice so instead he picked the method that would give the lowest result and claimed that 850 people were there." Ihe first thing that's false about this is that I picked the method I did so that I would get the lowest result. This, I'm afraid, is an outright lie. I used three methods, not just one, and I used all the methods I could, based on the limited information available. The most important piece of information, of course, was a video, taken near the end of the march, to which loads of pro-choicers had been pointing, saying everyone should look at it as it proved that thousands of people were there. I did look. I looked harder than anybody else, that's all. And it showed that about 850 people were there, which is about right for a loosely dispersed crowd that would have taken up three quarters of Kildare Street while on the move. The second thing that's false is that this method would give the lowest result, Andrew having previously said, "For lots of reasons a video taken at a particular moment in time may miss a lot of people. They may not have arrived, they may have left, they may be behind a lampost." But as those on the march said at the time, as did the Guards, the march swelled in size as it moved. It started with about 500 people at O'Connell Street, and gained people as it crossed O'Connell Bridge and went by Trinity. This video was taken almost at the end of the march. An inspection point close to the focus, it gave numbers that would have been pretty much at the peak for the march. Now, as I said, and as the BBC says, and as this useful article also says, it's simple to count a stationary crowd. You basically just multiply area by density, though you usually have to work with samples to get an accurate average density. Andrew, taking issues with my counting of the march, says "If we counted the March for Choice using that method from the area taken up at the end point and his claimed comfortable density we'd have got an attendance estimate of 5,150, This was actually twice our approximate count of 2500 but no less than 6 times his 'count' of 850." That's an interesting point. If they'd counted the march when it stopped moving they might have had something useful to tell people. If they were able to demonstrate its outer perimeters, and its typical density. But, you know, they didn't. And who were the people who claimed there were approproximately 2500 there? It wasn't Ivana Bacik with her 5,000 or Sinead Redmond with her 5-7,000. Or the girl who claimed on one website that she'd personally counted almost 3,000 and on another that she'd personally counted more than 3,200. But of course, none of Andrew's figures here can be proven. All we have to go on is a close-up video from somebody who was on the march that loads of people present said proved that there were thousands there. And it shows rather fewer than 850. For what it's worth, I'd never bought the notion that there were 10,000 people there on Tuesday. I'd heard credible people saying four, five, six, seven, and eight thousand. My rough calculations had given me six. So when Andrew says "Youth Defence gave him a figure of 10,000 to open with and a consistent application of his own methodology has managed to half that number to 5000," he's talking utter gibberish. I didn't open with a figure, unless you count my back-of-an-envelope 6000. And I certainly didn't start with Youth Defence's 10,000 which I'd immediately filed under 'R' for 'rhetorical'. Andrew does raise one serious point, when he rightly points out that in working out the ground space, I had included inaccessible areas, these being the sunken basement areas in front of lots of buildings on Molesworth Street. These areas are about 2 metres wide, but despite Andrew's claims, don't run uniformly along both sides of the street, and the videos make it clear that loads of people were standing on the steps leading up to doorways, a clue as to just how crowded the street was. Indeed, within the section of the street covered by the vigil, there were about 110 metres of basement. So, at 2 metres wide, I need to lose 220 square metres altogether. So 2600 drops to 2380. What about other objects on the street? Andrew claims the platform took up 60 square metres, rather than the 36 I'd guessed at, but it really doesn't look that big in any of the shots, and given that in the 19-second video he'd mistaken it for a space on the road between people, I'm not buying him on that. 2380 drops to 2344. Is it tenable that the screens and surrounding area took up 11 metres by 14 metres? Well, that's demonstrably false, as if we look eight seconds into the long Youth Defence video, it's pretty clear that the screen and surrounding space occupies rather less than half the width of the street, and that people are pretty close to it, certainly within two metres. That's not to say that there wasn't a point, maybe before things kicked off, when people stood well back from the screens, but things look to have been rather more crowded when the videos were shot while the speeches were on etc. The link to the photos by Paul Reynolds is very useful, as it shows - which I hadn't realised, but now it makes perfect sense and is quite discernible in the long video, that the screens are in fact a kind of van or truck. Now, Andrew thinks the dimensions of the truck are six metres by eight metres. I don't know about you, but I've never seen a vehicle on an Irish road that's six metres wide. That's twenty feet, pretty much. Just picture that. I have no idea what Andrew was smoking when he wrote that. Realistically, with some space around it, this truck comes in at about eight metres long and five metres deep. It's bigger than I thought, but not much bigger. 2344 drops to 2304. Andrew seems to think the van at the side of the road is two metres wide and a mighty eight metres long. I think he needs to look at the Youth Defence video again. Or, you know, at all. The van wasn't four times as long as it was wide. Maybe three times at an absolutely push. I'll stick with two metres by six. 2304 drops to 2298. And if we multiply this by three we get 6894, which with a margin of error of 20pc clocks in at a range of 5515 to 8273. That's with a fairly tight density, as I've said. Had it been concert levels of density it'd be 9192, with a margin of error to give us between 7353 to 11030. I'm pretty confident about my 7,000 figure even now. In considering the issue of density, Andrew says "TG's been careful to mostly select crowd pictures from near the screen or stage where you'd expect people to be packed most densely" which isn't merely an assumption of dishonesty, but one which is demonstrably tosh. I took screenshots based on clarity, as unlike him I didn't think there was much to be gained from pretending to count things when the camera's swirling blurrily around. The crowd is more spacious in the Kildare Street part of the vigil than on Molesworth Street itself, but this was to be expected; it wasn't hemmed in and had fanned out, people taking advantage of the lack of confinement to have more space. As for the claim that the crowd at the Dawson Street [sic] end of Molesworth Street is spread out at a density of one or at most two per square metre, all I can really do is marvel that Andrew can see well enough to type. Count how many people are spread across the street. Note how people have been pushed up from the pavements to pack the steps and doorways of buildings. It's all pretty clear on the Youth Defence video. Is it really tenable that a crowd so close could be classed as a loose crowd, or even a fairly solid one? Andrew uses Paul Reynolds' pictures to make a point about density, but none of these are timestamped -- there's no way of telling whether they were taken when the vigil was building up, when it was winding down, or when it was at its peak, which we should all agree is the situation we want to nail down. From the point of view of calculating crowd density, these pictures are utterly worthless. 7,000 it is, so, though this hardly matters compared to the value of human life. Because, after all, that's what's at stake here. Many of those "reporting" on the vigil would appear not to have been there, not only because of their gross misrepresentation of he numbers but their failure to report other facts. I have been attending pro-life rallies several times a year for over 30 years, and I've learned to roughly estimate attendance. As someone who attend the Tuesday vigil, I can say that any of the photos or videos I've seen do not capture the whole crowd. One would have needed to have several cameras at rooftop level on both sides of the street at several points along Molesworth Street. The camera positions were limited in what they could take in. There was an RTE camera on the second floor balcony of the Masonic Lodge, which is no more than a third of the way down he street - this appears to have been the camera used for most of RTE's crowd footage, which wasn't much, as the cameraman didn't stay for long. These pictures show the crowd from the Masonic Lodge towards the Dail, i.e. the top third or less of the street. I was close to the Masonic Lodge, but on the other side of the street, and early on Iasked my son to check to see how far back the crowd went as I couldn't see the end of it, even after I stood atop the steps to one of the buildings. He reported back that it was filled to a lane way about three quarters of the way back - that was before the speeches. I spoke to a friend after, who had arrived very late, from Dawson St. And she told me the crowd reached the end of Molesworth by the time she arrived. The crowd was supposed to be only in Moleswoth St, behind the barrier across the Kildare St. end but as more and more people kept arriving, the crowd could no longer fit into Molesworh St, and so there was a spillover into Kildare St, in front of Leinster House. One of the videos gives an impression of the numbers on Kildare St. Having assessed the crowd in light of my experience, I calculated an absolute minimum of 8000 for the whole period of speeches, with up to 10,000 at he height. Many people who were at the very far end, far away from the speakers, came late, and left early. Many people - I would say most, did not have a lit candle. Those of us, who tried to keep their candle lit, did so against the odds. I must have relit my candle at least ten times, it was out most of the time. 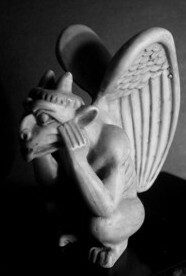 It was the same for most who attempted to keep an unprotected candle lit. Most people I saw didn't bother, or gave up when candles kept going out. Anyway, it was difficult to hold a candle if holding a poster, and most people (at least women) had bags. Parents with young children had their hands otherwise occupied than by candles. I wrote to paper to correct their gross misrepresentation of the numbers but it is unlikely to be published. Several things in the short report suggested the "reporter" was not there - the report even said it as raining, which it wasn't. And all MSM reports completely omitted the two speakers who spoke for longer than anyone else - Liz McDermott and Cliona Johnson, mothers who spoke about their children who had conditions for which the pro-abortion lobby wants to legalise the killing of babies. If the reporters had actually been here, surely these very beautiful testimonial would have been mentioned? The reporting was, generally, very sloppy, biased and misleading. It's easy to mention a couple of points made by the people well-known to the Press. As someone who has regularly attended the main prolife rallies each year for decades, I am glad to say there were quite a number of new faces at this last one. That knocks another 42 or so people off the count. Still, one thing that's clear from poring over the Youth Defence video is that people were right up against the van and up the steps to the doors of buildings. This was a tight crowd. Not concert tight, but tight for all that. We shouldn't hesitate to assume a 3 psqm ratio. It's a bit looser where it's on Kildare Street, of course, but that's where the crowd fans out a bit, occupying an area broader than Molesworth Street. So that's the first point. Allowing for this, with 3 people per square metre, and with the crowd occupying 2290 metres, we hit 6690. Watson and Yip say that if you're confident of area and density your margin of error is 10pc either way, so it looks as though there were between 6021 and 7359. And again, while we have to keep in mind that this isn't about numbers but is about a basic issue of human dignity, and how we cannot have any rights at all unless we're first granted the right to life. Fascinated by your analysis and attention to detail. You've certainly convinced me. But as you say it doesn't ultimately matter that much as numbers don't affect the principle that the right to life matters and without it we can't have any other rights.